At Food Delivery Guru, we strive for an unbiased approach when we review food delivery services. Our goal? We don’t want you wasting potential munching time trying to figure out which food delivery service to use! Bonus: Coupon code you can try on your first order! GrubHub was founded in 2004 by two web developers, Mike Evans and Matt Maloney. Tired of paper menus, Evans and Maloney entered their business plan into the University of Chicago Booth School of Business’s Edward L. Kaplan New Venture Challenge and won first place. From 2007 to 2011, GrubHub underwent a series of investment rounds and acquisitions that allowed them to expand and service more areas across the United States and the United Kingdom. Currently, GrubHub is based in Chicago with offices in New York and London and operates a portfolio of brands including OrderUp, Seamless, AllMenus, MenuPages, Restaurants on the Run, DiningIn, Delivered Dish, and LAbite. What areas does GrubHub service? As one of the oldest food delivery services, GrubHub has been able to amass a large delivery footprint across the United States and United Kingdom. In a 2016 earnings call with investors, CEO Matt Maloney stated that GrubHub delivers in over 50 major markets in the United States. What kinds of food does GrubHub deliver? Currently, GrubHub boasts a whopping 125 different cuisines on their website. From Afghan to American and Indian to Italian, whatever you crave chances are you’ll find it. However, and this should’d be obvious, GrubHub specializes in local food delivery so your options are limited by the cultural diversity of your market. What are people saying about GrubHub? We try to take people’s online reviews with a grain of salt. Typically, unhappy customers are more likely to share their negative experiences online (like Yelp or Google) than satisfied customers. However, we do our best here at Food Delivery Guru to showcase everyone’s opinion. Overall, ratings and comments for the GrubHub app in both the Google Play Store and Apple’s iTunes are genuinely positive. Head over to grubhub.com and create or log into your Grubhub account. Enter in your street address and use the filters to find available restaurants or cusines in your area. After you’ve made your decision, at your item(s) to the bag. 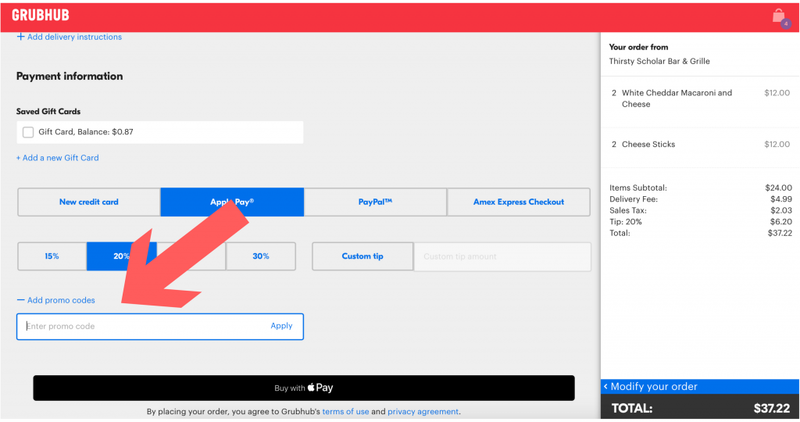 Enter in your payment information (if needed), and look for the “Add promo codes” link under the payments section. Zam! You just saved money with a Grubhub coupon! Download the Grubhub app here for Apple devices or here for Android. Select your favorite foods and add them to your cart. To checkout, simply click on the green “Continue to Checkout” button at the bottom. Double check your order then click on “Promo code” box towards the bottom. Enter in one of the Grubhub coupons above and hit “Apply”. Double zam! 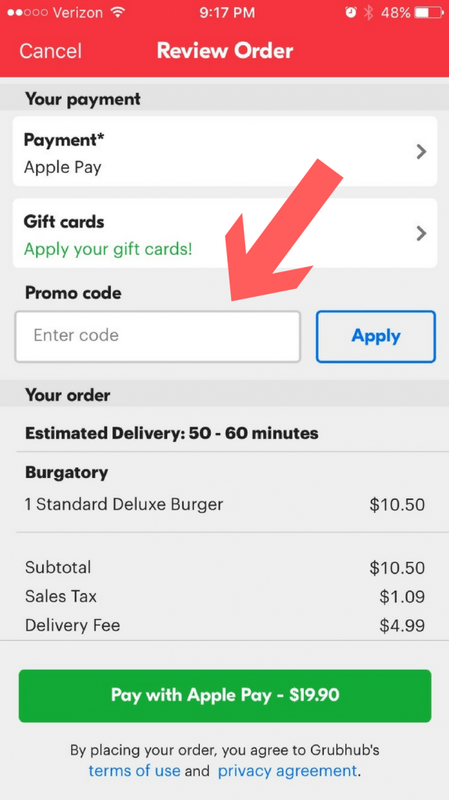 The Grubhub promo code just saved you precious dollar bills! Not sold? Here are some alternatives you can try.